Everyone who is fond of knitting asked a question more than once: how to find time to finish this or that product, work on which began few months ago? And it is necessary to manage and make a plan in order to finish successfully and not cause damage to the house and your family in a manner of time spent. Sometimes the ingenious thought comes to mind: but whether not to knit to itself a jacket, to the husband a sweater, and to the son – a hat. But in vanity of household chores of time for knitting practically does not remain. What it is necessary to make to needlewomen? The main thing in this case – to make the plan! Before work think over, what is the time you are ready to devote to this or that product. Decide on model or models. Connect a sample. Gain that quantity of loops which is specified in the description of model and connect centimeters 5-7. Surely note time. 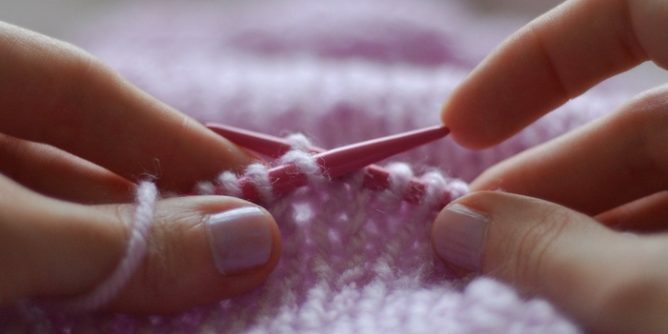 Now, by means of your sample and data on time spent to knit safely start calculations. There is my model below (see a photo on the left) on which I expected to work three months. And so, the chain was from 166 loops, all ranks 162 turned out. I knitted on three rows a day. As a result, I all was in time to term. In knitting, as well as in any business, the discipline, i.e. system approach is necessary. Regularity in this case – the key to success. If on knitting the whole day leaves, and you amuse yourself with a thought that the longer I sit, the quicker I will connect, then a certain obsession is formed. As a result, it will very quickly want to have a rest and postpone knitting for couple of days. Thanks to the plan it is always possible to find time for rest and for another important issues. Besides, also work speed increases over time. If you knit several things at the same time, then over time by all means there will be a question how to have patience that once not to throw everything. A secret is simple: you do not hurry and motivate yourself. First, as a result of work you will have not one thing, and a little. Secondly, there will be a certain pride of itself, that you achieved a goal. And it is not less important. Decide for yourself finally that you need really it. Because knitting is a hobby, but very labor-consuming. Besides, a lot of work over itself is necessary. Only having will power, by patience and self-confidence it is possible to make that others cannot. For me knitting became favorite work. And a payment for it – my identity and my son. Think, then you are capable to offer (a dream, personal walk, etc.) the child had a beautiful hat, and you have a fine jacket. You remember, there are no words “I was tired therefore today I will not knit”. Your hobby is also exclusive rest. Learn to knit on the run. For example, on walk with the child, on the way to work. The main thing – not to be afraid to seem silly and ridiculous. It is possible to knit during viewing of the TV and by preparation for examination. For young mothers favorite needlework – when the kid fills up the most convenient time for occupation. The lunch break quite will be suitable for the working women also. And finally, last and very important council: when you connect the quantity of rows put for today in the works, surely postpone knitting. Remember that any hobby always requires time. The main thing – is correct to plan it.